Longer-Lasting French Bread. French breads such as baguettes made with a preferment or a starter -- also known as a poolish – don’t go stale as quickly as breads made without a starter.... Longer-Lasting French Bread. French breads such as baguettes made with a preferment or a starter -- also known as a poolish – don’t go stale as quickly as breads made without a starter. Longer-Lasting French Bread. French breads such as baguettes made with a preferment or a starter -- also known as a poolish – don’t go stale as quickly as breads made without a starter.... Most of the year I reach for dried bread crumbs. I use them to bread meats and throw them in meatloaf. But in the summer, when I make cod cakes and crab cakes, I find myself making fresh bread crumbs. So while bread crumbs aren’t really seasonal, they sort of feel like it to me. It does add flavor and helps to dry out the bread so you get nice crispy crumbs. Simply preheat an oven to 350 degrees, lay your bread out in a single layer on a baking sheet, and toast for about 10 minutes. If for whatever reason you don’t feel like firing up the oven, I do suggest letting your bread sit out on the counter for an hour or so beforehand to dry …... About recipes search engine. Our website searches for recipes from food blogs, this time we are presenting the result of searching for the phrase how to quickly make dried bread crumbs. Longer-Lasting French Bread. French breads such as baguettes made with a preferment or a starter -- also known as a poolish – don’t go stale as quickly as breads made without a starter. Most of the year I reach for dried bread crumbs. I use them to bread meats and throw them in meatloaf. But in the summer, when I make cod cakes and crab cakes, I find myself making fresh bread crumbs. So while bread crumbs aren’t really seasonal, they sort of feel like it to me. 16/05/2015 · Want to do some frying, but don't have breadcrumbs? 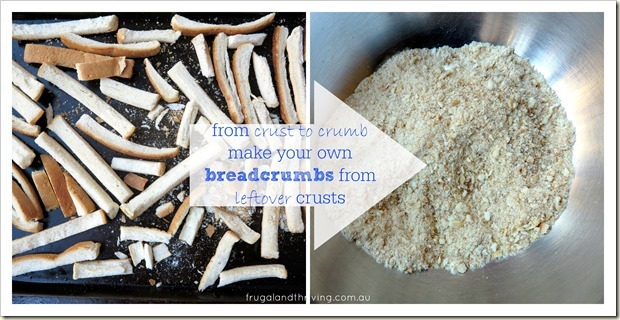 Or you have some unfinished breads, but you just don't want to waste it..Why not make some breadcrumbs and store it in the fridge!